Undoubtedly right up there with camo in terms of popularity are animal-print motifs. 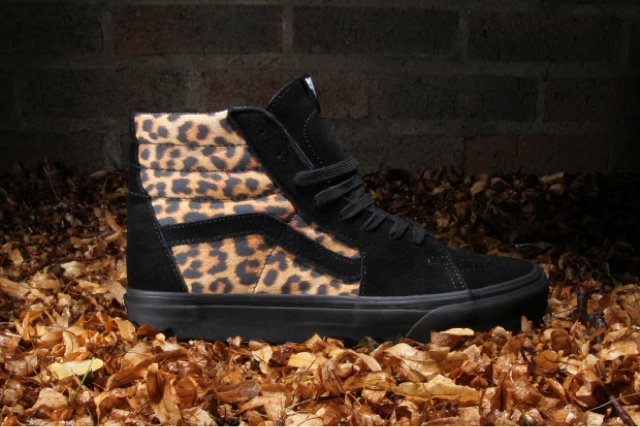 Thus, Vans introduces a “Leopard” edition of the Sk8-Hi. Resigned to tastefully incorporating the spotted print throughout its quarter panels, the remainder of the shoe sees black applied to the suede toe and heel, eyestay, matching tongue, and laces. Finished with black leather lining, solid black rubber foxing, and a gum rubber outsole, the Vans Sk8-Hi “Leopard” can be picked up in-store and online now via Premier for $65 USD. Nike Kobe 8 System "Red Boa"
Nike Air Max 1 Premium Tape "Petra Brown Camo"
LeBron James - King of Rap?! Nike SB Zoom Stefan Janoski "Blue Recall"
Nike LeBron X EXT "Hazelnut"